On Easter Sunday, 2015, a fourteen year old kid took his life while incarcerated in a Georgia facility. Allegedly, prior to his death, he called out to his fellow inmates, saying he would kill himself. Help didn't arrive in time. Suicide threats, suicide watches and successful suicide occur too frequently inside a juvenile facility. In spite of procedures in place to protect kids at high risk for suicide, measures fail and the result is a tragic, senseless death. This kid hung himself from the ceiling sprinkler, using his jumpsuit as a noose. We failed this kid. For most youth in detention, there is a resume of neglect, abuse, trauma and pain. And how can we protect the next kid? As a correctional educator, I have seen hundreds of kids at high risk for suicide. Ending life in a locked cell is a brutal way to go. Especially at age 14. There are other brutalities in juvenile facilities. I have written about the scope of those hardships for kids in a book to be published this August, 2015. Protecting our youth asks that we restore a broken, harmful, and sometimes lethal system. 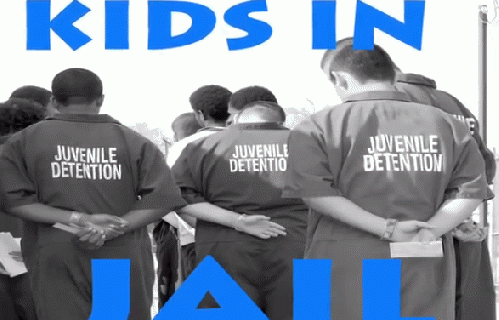 KIDS in Jail tells the gripping story of youth incarceration...teens raging and weeping through life. In a broken and flawed system , the book gives voice and homage to street soldiers, young men and women, whose lives as our nation's throwaway kids often begin as youth in foster care or in brutal home lives. This chapter of life often advances to the juvenile jail system, where a career in crime begins. The plight of custody haunts us and chronicles lost childhoods and budding convicts, many of whom will return to live among us, and so sadly others to spend their entire lives behind bars. Their trials are enormous and yet many teens convey a hope that lies beneath the rubble of despair, rage, illiteracy, and prayers of suicide. Our youth at risk suffer enormous hardship as they struggle to adulthood. Many will spend long stretches in prison. Some have one or even two strikes, which puts them at risk for a life in prison. Strong intervention can reverse the wretched prison pipeline. Alternatives to incarceration must be implemented in greater measure. These kids are born into darkness and our intervention can light their way. Life in detention brings indignities, barbed wire, lack of privacy with toilet use, shackles, and deep despair. Kids grow up amid a climate of felonies, lockdowns, physical abuse, sexual abuse, shrieks of unstable youth, violence and anguish. Lost childhoods abound. The cradle to prison pipeline is real, devastating and generational. Kid jail often ends in adult prison. Broken lives abound. Fractures scream out a scorching rage without warning, and a stream of suffering floods the space where we hope to open hearts and minds. The trail of anguish goes on and on and on. For kids it is scandalous, tragically scandalous. There is no immunity to the collective pain of incarceration. I am never prepared for the story that will be shared when a kid decides to talk about the twists and turns of an impoverished street life without the basics of food, shelter, love and hope; rather, growing up with the pain of abuse, neglect, homelessness, poverty, parental absence and emotional adversity. The remodel of this system is long overdue. KIDS in Jail will contribute to transforming such brutal conditions for kids whose lives have been filled with every kind of poverty, including financial, cultural, familial, and academic. The scars of physical and emotional abuse become scars of spirit in a setting that does not foster rehabilitation, but rather is founded on punishment and dishonoring children. The kids that witnessed the Georgia suicide, who saw a kid hanging in his cell will carry the shock of that moment forever. Tragically. Appallingly. Enduringly.